With breathtaking descriptions and humorous anecdotes from his 2,176-mile journey along the Appalachian Trail, Paul Stutzman reveals how immersing himself in nature and befriending fellow hikers helped him recover from a devastating loss.After Paul Stutzman lost his wife to breast cancer, he sensed a tug on his heart--the call to a challenge, the call to pursue a dream. Paul left his stable career, traveled to Georgia, and took his first steps on the Appalachian Trail. What he learned during the next four and a half months changed his life--and will change readers' lives as well. In Hiking Through, readers will join Paul on his remarkable 2,176-mile hike through fourteen states in search of peace and a renewed sense of purpose, meeting fascinating and funny people along the way. They'll discover that every choice we make along the path has consequences for the journey and will come away with a new understanding of God's grace and guidance. 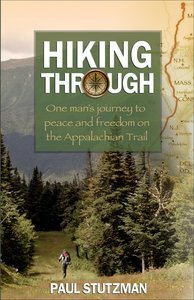 Nature-lovers, armchair adventurers, and those grieving a loss may not be able to hike the AT themselves, but they can go on this spiritual pilgrimage with a truly humble and sympathetic guide.Paul Stutzman is a former restaurant manager who left his career after his wife's death from breast cancer. He hiked the Appalachian Trail in search of peace, healing, and freedom. His passion and mission is to share what he learned on that remarkable journey. Paul grew up in the Mennonite church. When he is not hiking or on a cross-country bike ride he makes his home in Berlin, Ohio. After Paul Stutzman lost his wife to breast cancer, he sensed a tug on his heart--the call to a challenge, the call to pursue a dream. Paul left his stable career, traveled to Georgia, and took his first steps on the Appalachian Trail. What he learned during the next four and a half months changed his life--and will change readers' lives as well. In Hiking Through, readers will join Paul on his remarkable 2,176-mile hike through fourteen states in search of peace and a renewed sense of purpose, meeting fascinating and funny people along the way. They'll discover that every choice we make along the path has consequences for the journey and will come away with a new understanding of God's grace and guidance. Nature-lovers, armchair adventurers, and those grieving a loss may not be able to hike the AT themselves, but they can go on this spiritual pilgrimage with a truly humble and sympathetic guide. Paul Stutzman, an avid hiker and biker, writes of his adventures from his home in Berlin, Ohio. After losing his wife to breast cancer in 2006, he left a long career in restaurant management to thru-hike the Appalachian Trail in search for personal healing and peace. The story of the trek that changed his life and and faith is recounted in his first book, Hiking Through: Finding Peace and Freedom on the Appalachian Trail. In addition to writing, he speaks to groups about his hiking and biking adventures and the lessons learned during these exceptional experiences.